Life Tastes Good » 2011 » January - A diary of food and wine from the perspective of a passionate cook who is inspired by the colors and flavors of the changing seasons. Preheat oven to 375 degrees F. Heat the 1/3 cup olive oil in a large Dutch oven over medium high heat. Season the shanks generously with salt and add them to the pan. Patiently, brown the shanks well on all sides. This should take about 12-15 minutes total. Meanwhile, puree the next 4 ingredients in a food processor. Set aside. Remove the shanks and set aside in a tray. Discard all but 2 tablespoons of fat from the Dutch oven, and add pureed vegetables. Season with salt to taste. Saute about 15 minutes until the veggies are brown. They should have almost formed a crust on the bottom of the Dutch oven, without burning. Add tomato paste and brown for 5 minutes. Stir in the wine and the herb bundle, and reduce the wine to about half. Add the shanks back to the pot, and pour in 4 cups of the broth or water. The shanks should be submerged in the liquid. If they are not, add more water. Cover the Dutch oven and place in the oven. Check the shanks in about 1 ½ hours, and turn them all over. 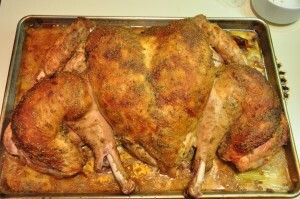 Place back in oven, covered, and cook for another hour to hour and half. Check the shanks every 30 minutes or so, checking to make sure that the liquid has not reduced too much. If it has, add more water. You may also de-fat the sauce as you go. You may also remove the lid at the last 15 minutes of cooking to maximize browning. The meat will be incredibly tender, and falling off the bone. Transfer to a serving dish, and sprinkle with gremolata if desired. Serve one shank per person, over mashed potatoes or soft polenta… Enjoy! Optional Gremolata: Combine zest of 1 orange, zest of 1 lemon, ¼ cup finely chopped parsley, 1 minced garlic clove, and 2 tablespoons of freshly grated horseradish, Sprinkle on the lamb shanks just before serving. This adds a lovely brightness to the dish! I would drink this with a southern Rhone blend with a lot of juicy ripe fruit character. 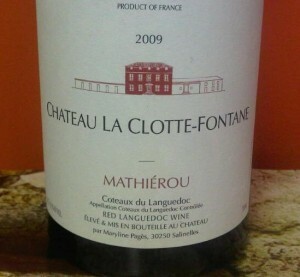 I love the 2009 Chateau La Clotte Fontaine Mathierou. It’s a perfect blend of Grenache and Syrah showing dark berry tones and balanced spice. Gorgeous length. 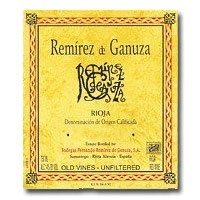 It’ll be available again soon at 56 Degree Wine. 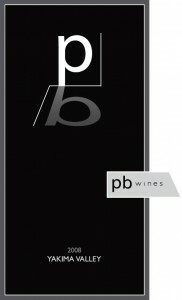 Another great wine to try this with would be the 2008 PB Wines Syrah Yakima Valley. A new world option, this wine shows lush dark berries and fig, and the length is incredible as well. This is sort of a second label of Rasa Vineyards - I love the story behind this union of brothers who make and sell some fantastic Rhone-style varietals. 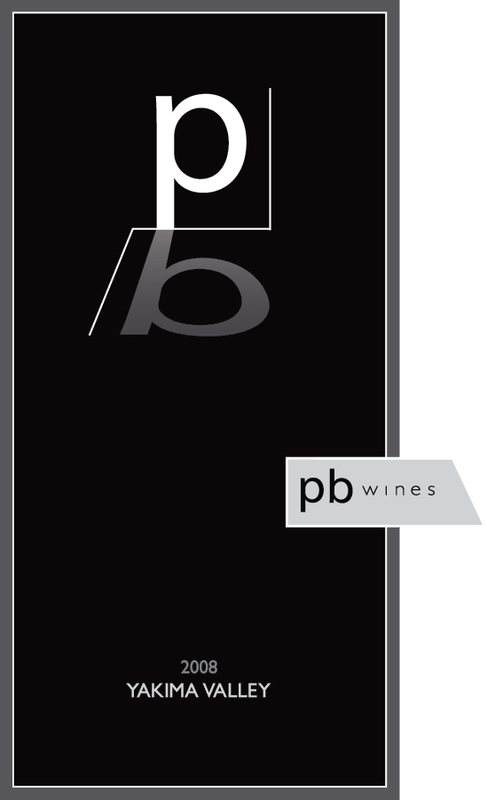 Read here to get the scoop on PB wines! This is also available at 56. 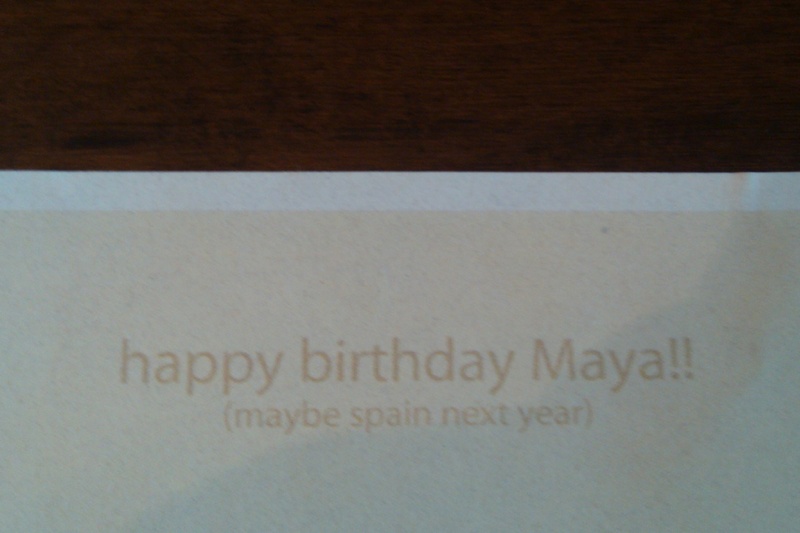 A few months ago, Maya told me that for her twelfth birthday, she would love to visit Spain. When I asked her why, she simply stated that she thought it would be a cool country to see – the sights, the people, the language…… the FOOD. Ah! There it was! MY Maya was back. 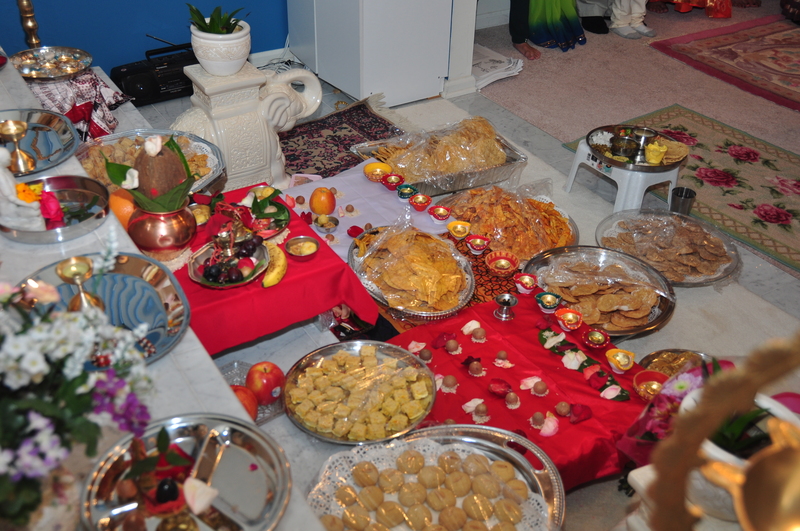 She took a few years off from being the foodie we bragged about back in San Francisco… but friends, this was it. I saw the spark in her eyes as she talked about tapas. She was BACK! 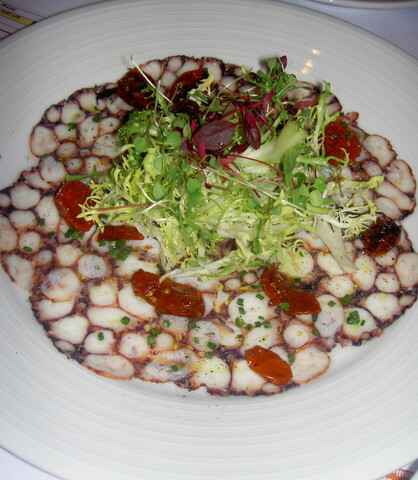 Some of you may remember the little girl who used to go everywhere with us in San Francisco – ordering the sushi rolls and sashimi, the shellfish risotto, and the (brace yourselves) oysters on the half shell from the raw bar. She wanted the lamb when the option for chicken fingers was present, and as I stated in one of my previous posts, only “fancy mac and cheese” would do for her – none of that “K” brand stuff! Yes, she made me proud. 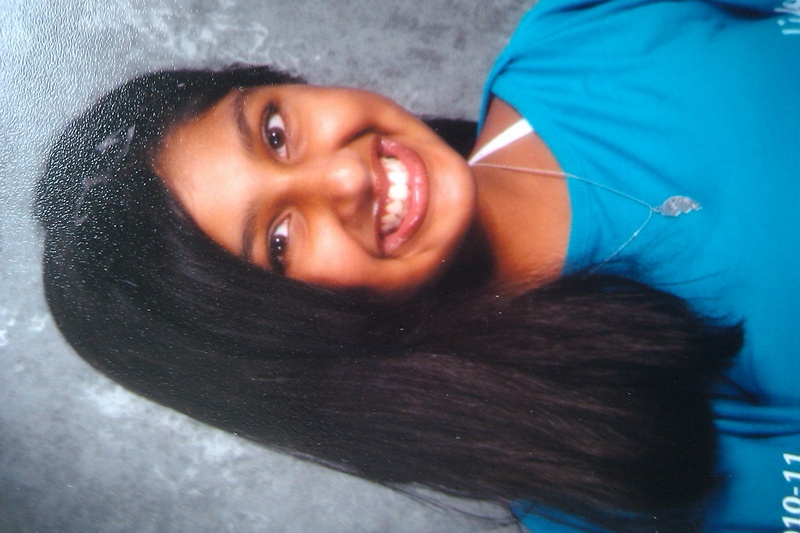 But for whatever reason (Manish blames it on moving back to the burbs) she regressed after moving back to NJ. She had issues with “green stuff” in her pasta sauce (ie herbs!) And the more exotic the dish, the less she wanted to try it. She still loved sushi, but it was the super adulterated rolls that were intriguing her now (ie the Berkeley Heights Roll, the Basking Ridge Roll, The Philadelphia Roll… you get the point.) Sigh. Burgers, dogs, and fingers were the items that she was now excited about. And the Cassoulet, Coq au vin, and Moules frites that I attempted to entice her with were too bizarre to even fathom. Double sigh. Fast forward to a few months ago. I told her that Spain was pretty much out of the question (HELLO!!!? ?,) but perhaps we could consider doing something else? 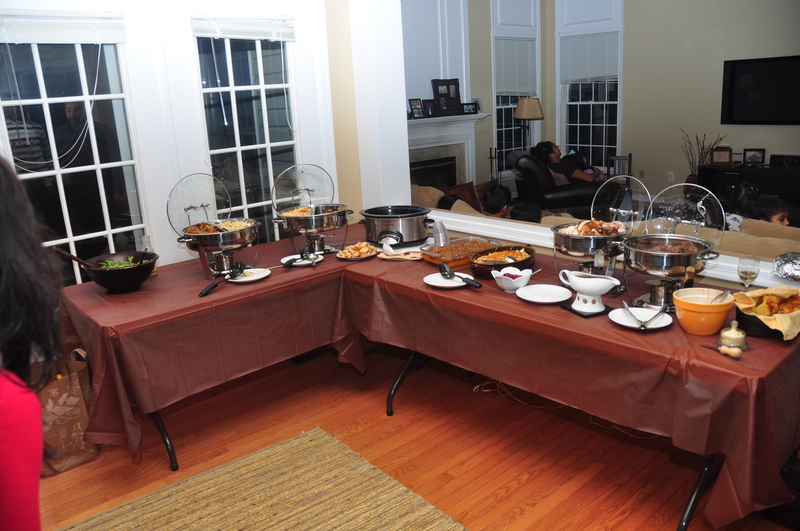 She asked if we could go to dinner…. at elements. 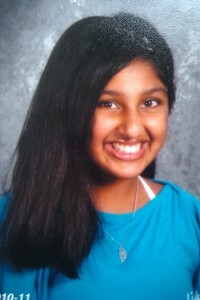 She heard Manish and I talk of our experiences at elements and said she was intrigued. “Will I like it?” she asked. “No, You will love it.” I answered. And she did. She LOVED trying everything that Chef Scott Anderson put on her plate. She felt like royalty, and was truly honored to be catered to the way the entire team at elements did. She called the experience “Magical.” And it was. My baby loves elements. Oh, we are in TROUBLE! See below for the details of our meal. The tuna tartare was spectacular, dressed with scallion, ginger, and white soy. The Buri (adult yellowfin) was served sashimi style and was so buttery and savory. I actually caught Maya closing her eyes at one point, just soaking in the awesomeness of the fish. She was so intrigued by the purple cabbage soup. Inside were chunks of pastrami… every bite was so balanced with seasoning, so colorful. 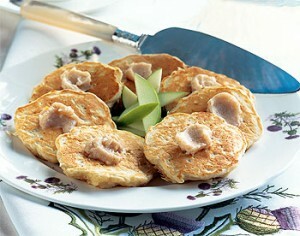 This was one of her favorite dishes. Next was the local tilefish. This was pan seared and accompanied by caramelized endive, macadamia and coconut. 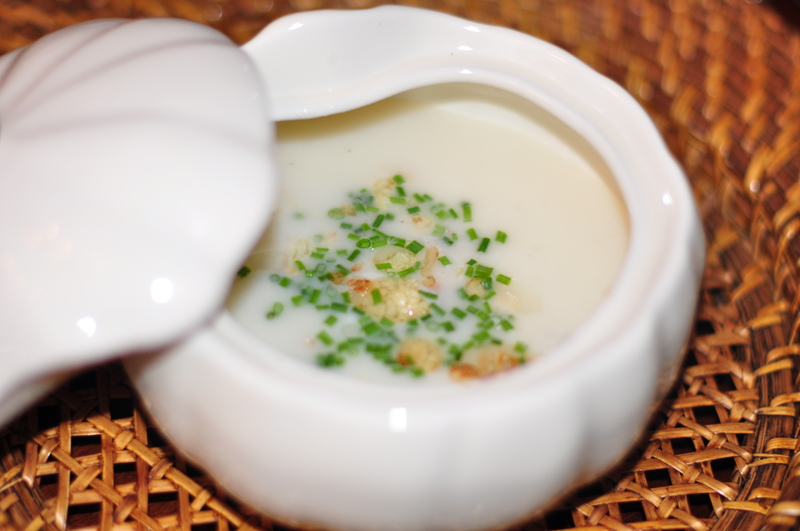 The dish encompassed such an “island” flair. Fabulous combination of flavors! A foie gras course was introduced next… Maya was excited to try it, but unfortunately did not enjoy it as much as Manish and I did. 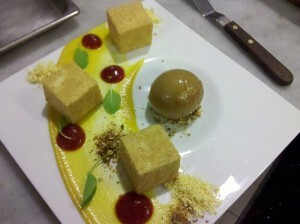 The sweet and tart flavors of the fruit “tart” accompaniment provided a perfect balance to the rich and buttery torchon. 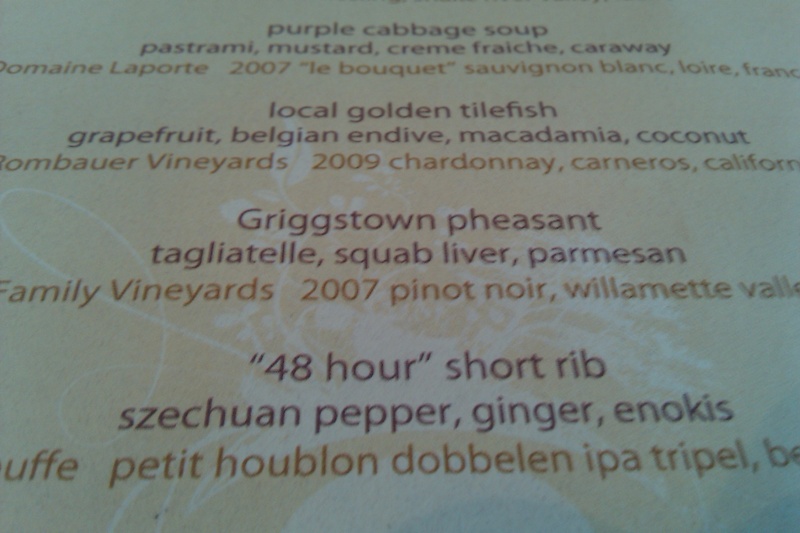 Next was the pheasant. It was accompanied by a tagliatelle with a sauce made with squab liver. 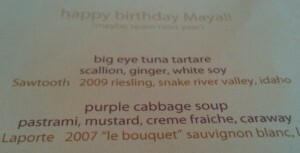 Maya LOVED it, and told us that she couldn’t believe that squab liver could taste so good. The 48 hour short ribs was Maya’s favorite. She is a die hard comfort food fan, and the ginger, szechuan peppercorn, and petite mushrooms didn’t sway her one bit. She remarked that it was even better with all of the sophisticated flavors. Maya had the “kit Kat” dessert while Manish and I had the cheese course. 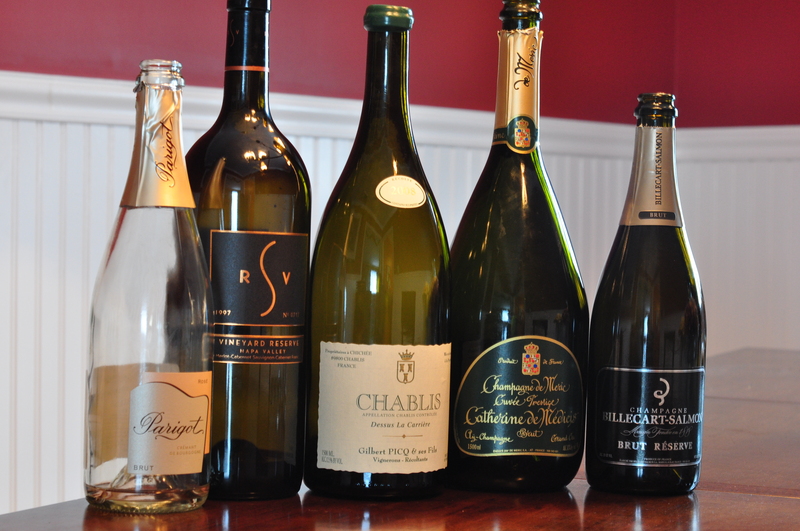 Manish and I sampled some of the wines/beers that Justin suggested to pair with the courses. 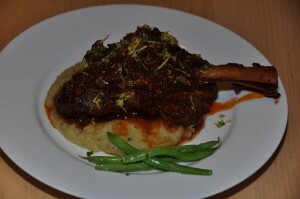 We loved the way the Chouffe Tripel paired with the short ribs. This was a match that we would have never thought of but the Belgian IPA style went perfectly – especially due to the flavors in the short ribs. Another favorite pairing was a special pour of the 2007 Dehlinger RRV Chardonnay. This was perfect with the tilefish, and those magnificent tropical flavors. 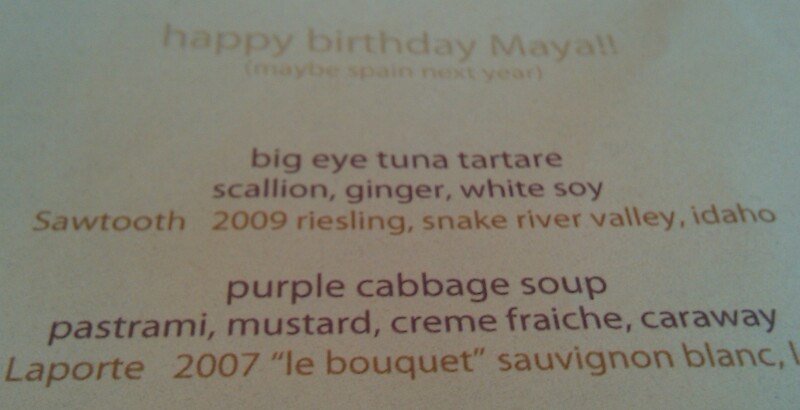 On our way home, we re-capped what our favorite dishes of the night were, and Maya summarized her evening in one word. MAGICAL. The only thing that I regret is not having my camera with me to capture some of the amazing expressions on her face throughout the evening. Next time, I guess! Last week, I found myself craving a colorful, textural, and bright salad. I wanted to serve this at a dinner party, so I decided that it had to be plated beautifully. I reviewed some of my recipes, but nothing popped out at me. 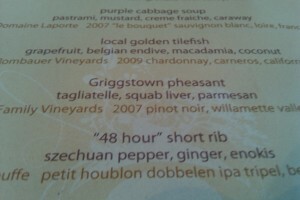 When I run into a “menu planning block,” I often make my course selections according to the wine pairing. It was decided that either a Sancerre or Chablis would be served with this course, so I planned accordingly. I thought of cheese… what better pairing for Sancerre or Chablis, than a mildly tangy soft cheese? So, it was decided… a goat cheese would be highlighted. The rest, well, I was at the mercy of my local Whole Foods. I visited the local market section, and was pleasantly surprised to see the most fabulous looking beets. Although not exactly “in season,” the beets were so fresh, their greens still perfectly shaped. The red variety were the only ones I could find, so I decided to get a bunch. I love the buttery texture and sweet flavor that the beets possess when they are roasted, so I was hoping to build the remaining ingredients around that idea. I then came across a tomato section. Though not from local sources, the adorable little yellow cherry tomatoes from Texas caught my eye. 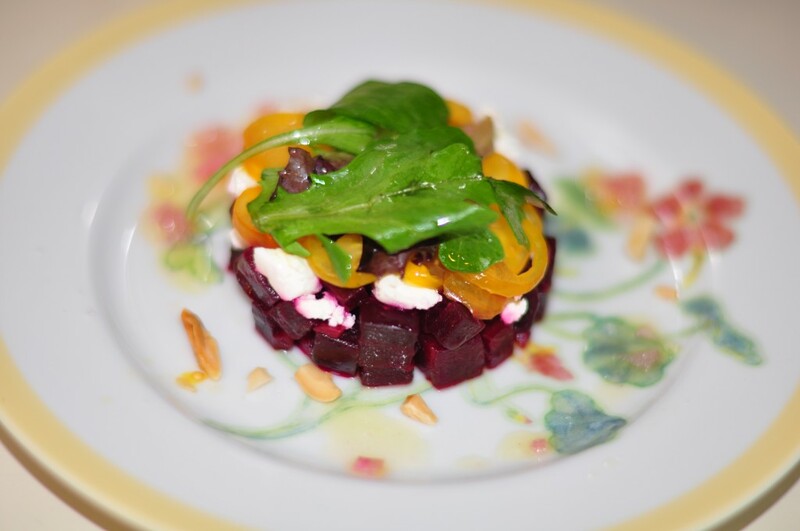 My course was coming together – a play on my red and yellow beet salad with goat cheese and herbs. Here is my recipe for the salad that came together at the market – literally. An unlikely winter salad, for sure, but the flavors were delicious and I would highly recommend trying it – any time of the year that you can find these ingredients! 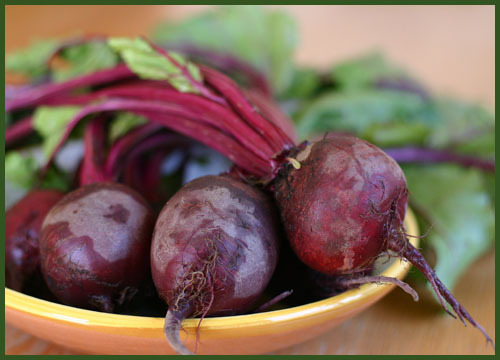 Wrap beets (without greens) individually in foil, and place on a baking pan. Roast in the oven at 400 degrees F for about 1 hour. Unwrap the beets, and set aside to cool. 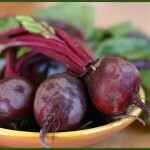 While beets cool, combine shallots, lemon juice, salt and pepper in a medium sized bowl. Add the oil in a stream, whisking to emulsify. When beets are cool enough to handle, peel them and dice them into a 1/4 inch size. Place in a bowl, and pour 1/8 cup of the vinaigrette and mix gently to combine. Assemble: Toss baby greens with 1 some of the remaining vinaigrette and set aside (do not overdress.) For each serving, place a 3-inch ring mold in the middle of salad plate. Put an eighth of the beets in the ring mold and press down gently. Crumble a couple teaspoons of goat cheese on top of the beets, and then top with sliced yellow cherry tomatoes, forming a concentric design and covering the top. Remove ring mold. Place a small handful of baby greens on top of the tomatoes. Sprinkle almonds around the plate, and drizzle with a teaspoon of the remaining vinaigrette. Serves 8 as a first course. 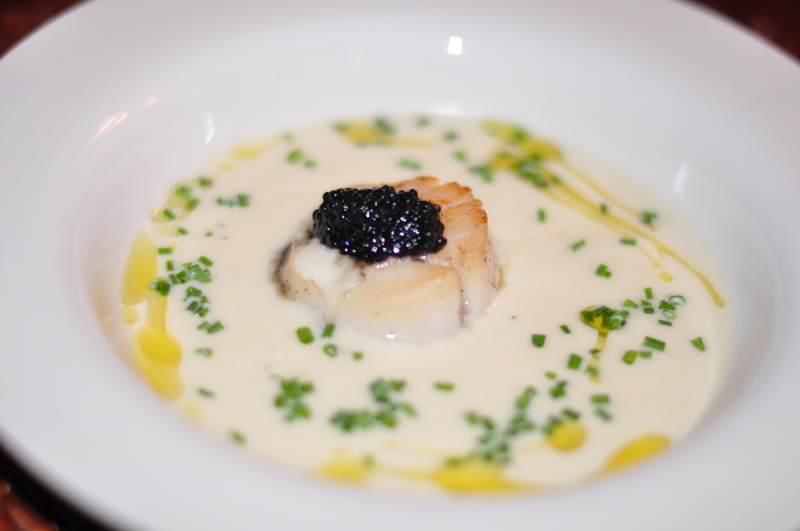 And paired with the 2008 Gilbert Picq Chablis “Dessus de Carriere” was a perfect match! 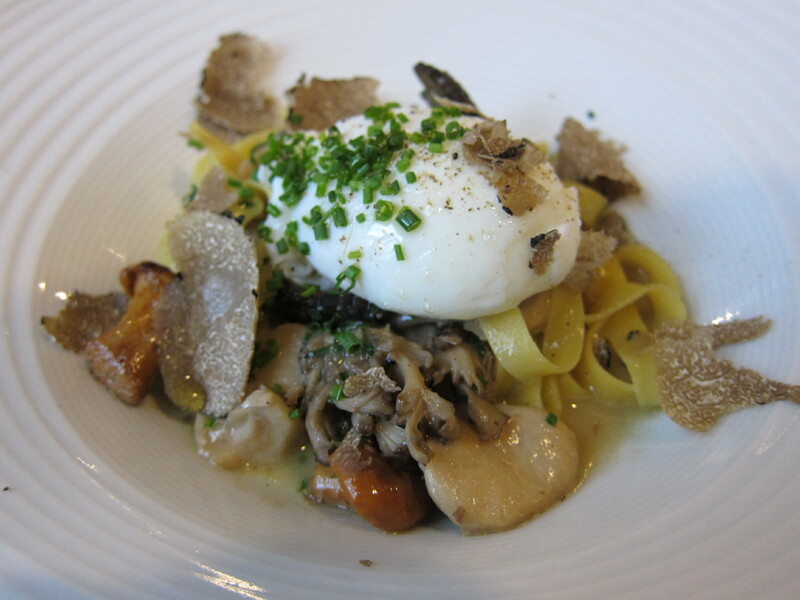 It’s been a while, so instead of recapping every culinary experience I’ve had the pleasure of having these past couple months, I decided to post some of my most memorable consumptions of the 2010 Holiday Season! Sej & Rick's Tgiving Feast! 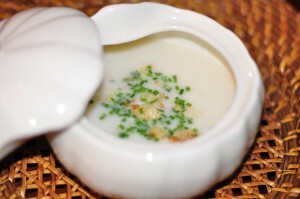 You are currently browsing the Life Tastes Good blog archives for January, 2011.